For such a simple dish with simple ingredients, this was amazing. Seriously, I couldn't stop eating it. One serving is definitely too small, and you will want at least 2 or 3 servings at a time. This dish packs such a huge amount of flavor! Cherry tomatoes are roasted with olive oil, balsamic vinegar, garlic, and fresh rosemary. The tomatoes I used sat on the counter for a few days, so they were extra sweet. And wow, the smell that filled the kitchen while these were roasting...woodsy rosemary and tangy balsamic and fragrant garlic. Don't tell me that doesn't sound delicious! In fact, the tomatoes would probably be wonderful on their own, or served over pasta maybe. 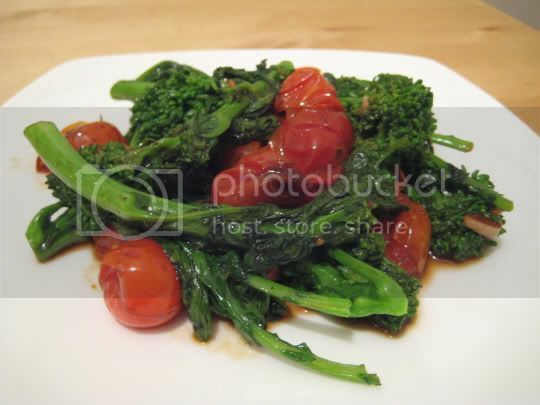 Broccoli rabe is a bitter, crunchy green (sort of like eating a mix of broccoli florets and mustard greens), but the bitterness and pungent flavor was an EXCELLENT combination with the sweet tangy tomatoes. Make again? Yes, doubling or tripling the recipe! Anyone would love this dish.